The rest of us only got a short glimpse of the veritable eye candy that was MeasureMap before it was cruelly snatched away by Google into perpetual closed beta oblivion. 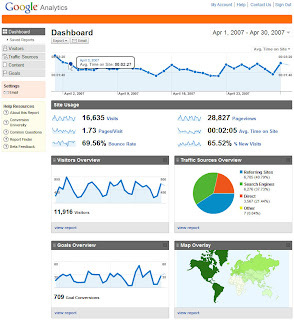 There’s nothing to suggest that the service will ever be open to new users… and this has been further compounded by the release of a new interface for Google Analytics, MeasureMaps’ older (and slightly crustier) brother. From what I can, Google Analytics has been slowly bathed in the GUI-goodness of MeasureMaps, with some of it marinating nicely into the more established product. Such evidence confirms my suspicions that MeasureMap’s acquisition was made more for it’s interface fu (along with its fu master, Jeffrey Veen) more than anything else. Clearly the intention has been to improve Google’s main stats offering rather than launch a secondary services (such behavior got Yahoo! into a bit of trouble). The new analytics UI looks good though, eh? I’m running the new version here (I think everyone is now?) and I’m missing the ‘month’ view option there used to be if you set a timeframe of a few months… it’s a real shame, as you can no longer clearly see the month on month trend of your traffic. Other than that, it all looks shiny. The map is much better. New interface is slick, but where in the intra-day view gone? Annoying. It took me some time until I got familiar to new G Analytics, but it is better than the previous version. Especially, I appreciate the ability to check traffic from search engines. Having this thing moves you forward and forward all the time because man feels bad when the traffic is low or stable.